Quite often I end up feeling a little bit guilty in the evenings or weekends if I am sewing or crafting. Without making him sound boring, Adam hasn’t really got any hobbies at the moment. Everything that he would normally spend his time doing just isn’t available to him at the moment. His motocross bike and Playstation are in the UK and we haven’t got a garage either so he hasn’t got any projects going on. He doesn’t at all make me feel bad…I just can’t help it sometimes! However, that all changed last weekend! He has been doing quite a lot of research and making a list of projects that he wants to complete. 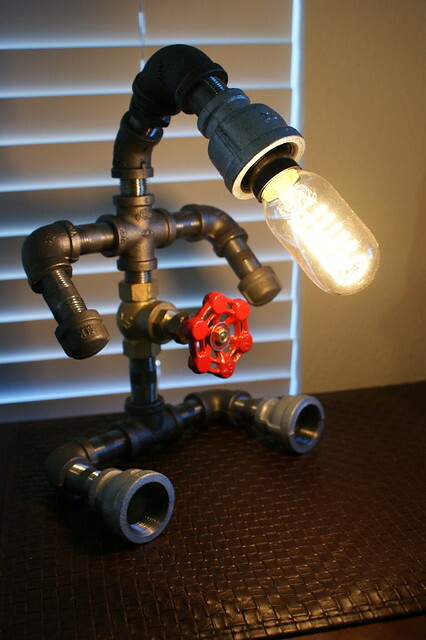 On that list was a lamp made out of pipe fittings – a small project that he can complete in the apartment. We spent over an hour in the hardware store selecting the materials he needed. We were both quite excited. He worked on his project over a few evenings when he returned from work. Despite there being lots of pictures on the internet of similar projects, there was no definitive tutorial to follow. I’m not going to go in to the ins and outs of how it was made as I’m not clued up with the electric side of things. He made the red valve into a rotating switch to turn the lamp on and off. Adam is quite a perfectionist so he spent ages ensuring that the electrical connections were to a high standard. He also ‘grounded’ the electric source just in case any inner connections came loose. As the full lamp is metal, we didn’t want to get electrocuted at any point! The fittings were quite expensive and the cost of the lamp was just under $90. Even though I did raise my eyebrows a little at the price, the quality and the fact that it is handmade make up for it. 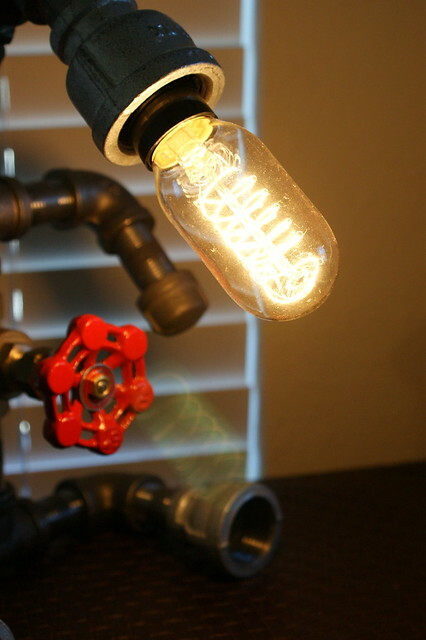 I particularly like the vintage inspired coiled filament bulb! That looks impressive! My husband would like doing something like that too. This is unique! I love it!! Pingback: Talented Tuesday Link Party #15 - Cook. Craft. Love.